I really appreciated your question about stashes, and Lynn’s answer about printing on little scraps of fabric that already have color on them. Can’t wait to work with techniques from this book! This looks like a must have for the studio library! Thanks for the chance to win a copy! These are such good, good, questions, Melly! I loved reading them almost as much as Lynn’s answers. I learned so much about her (and actually, you as well!) that I had not yet learned from either reading her blog for all of this time, nor her wonderful posts on facebook. So, thank YOU for this process..it was truly educational. Now, to her book! Oh, yes, I do so wish for one! I know it is something I would truly study, use, and appreciate!!!!! Blogs are fabulous but books are something to have and to hold and to pore over as treasures! Would love to add the book to my collection. Thanks for the interview. Melanie, I always enjoy looking through your blog. Thanks for the opportunity to enter for a chance to win Lynn’s new book. I’m always intrigued with new surface design books and I especially like Lynn’s approach to fabric with room for hand stitching which I’m doing quite a lot of in my own work now. It looks like a great addition to my studio reference library! Thanks for a great interview Melly. Love reading about people’s creative processes. The first thing I read about Lynn’s book intrigued me. Your interview has only increased that appeal. It is at the top of my wish list. Thank you for thoughtful questions. This is my first visit to your blog and I am so happy to find you–I would love to have a copy of Lynn’s book. I loved reading your questions and Lynn’s replies. 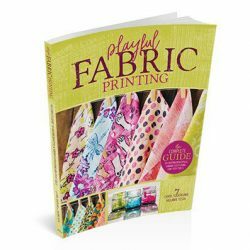 It is hard to find a good book about creating your own fabrics using paint as your medium rather than dye so I’ve been very excited to get my hands on Lynn’s book ever since she announced it. Maybe I can win one the blog hop. Thank you for the chance! 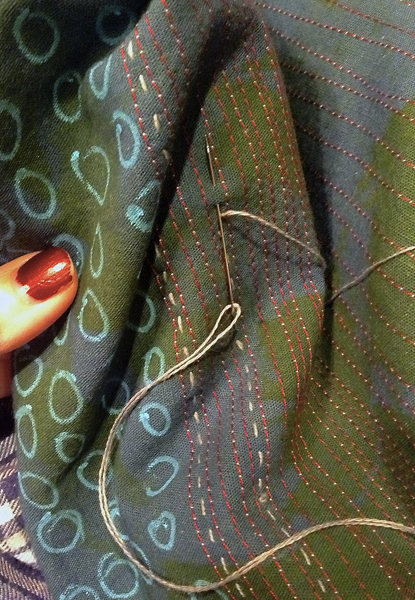 I too love to hand stitch on surface designed fabrics and can’t wait to get Lynns book in my own hands. Hope I win a copy, that would just be the icing on the cake!! This blog hop is so inspiring. Would love to win a copy of Lynn’s book so I can learn from one of the best. Thanks for interview and the chance to win! This would be a wonderful surface design book for inspiration. Thanks for the chance to win! Your questions to Lynn we’re wonderful always good to hear the author of the book answer questions. Would love to have a copy of Lynn’s book to have as a resource. Thanks for such a great interview of the author. great questions! I would love to read more about Lynn;’s hand stitching! 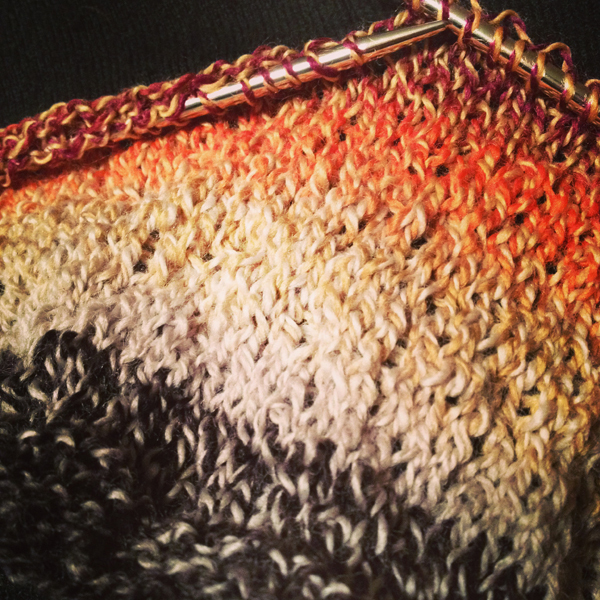 I’ve been following the blog hop and everyone finds something different to love about it. Maybe it’s a true classic already! It would be a marvelous thing to win a copy! I love Lynn’s work, and yours, as well. I love handstitching and am eager to get more of it into my repertoire. And printing is such an exciting medium — Lynn’s work is amazing, and I’m eager to see what she has to say. Wonderfully well written and photographed blog post, as usual! Thanks for the giveaway! Mel you are amazing. The end. 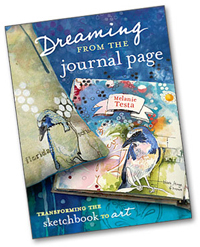 Each blog has it’s own voice but all seem to agree that Lynn’s book is a great addition to A CREATIVE LIBRARY. I want this book. What a great post. I have always been intersted in surface design with paint on fabric. I enjoyed all of your questions to Lynn. Now I’m very interested is seeing this new publication. Great interview! This book looks fantastic. Thanks for the chance to win one! 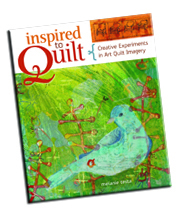 Every post on this blog hop increases my interest in this book. I took a class from Lynn. 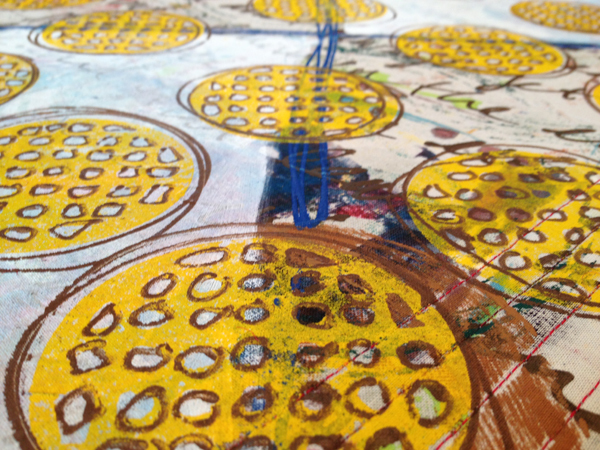 She’s a great teacher and she changed the way I think about fibers and printing. Love to have her book! I follow Lynn on Facebook and even though I never thought about printing my own fabric OR doing handwork until I saw what she was doing I am getting inspired! I’m thinking some fabric printed in the summer in the yard, and then hand stitching in the fall — before ski season starts. I am starting to dig into surface design as I like the feeling that the comes from having a project that is all yours from the ground up. I’d love to try my hand at the techniques in this book! And what great interview questions! Loved the questions and responses. Thanks for a chance to win the book. This will be a big help to me. Thanks for offering this book! I usually start by printing for a project but once I get all the stuff out , I end up printing a stach to use up paint and dye that I have out. 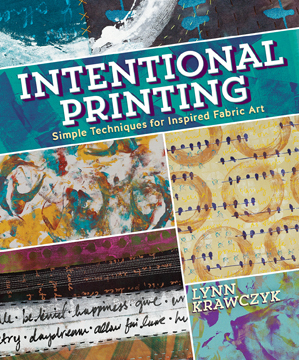 I love using printed fabric and look forward to see what Lynn lays out in this book. Thanks for the opp to win it. Nice post! Love the use of so many techniques in this book! Thanks for chance to own it! Hi Melanie! What a great interview! 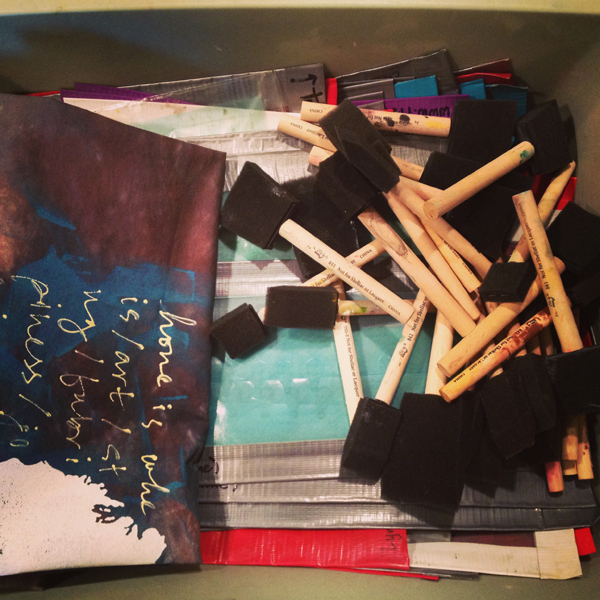 I’v wondered what to do with painted/dyed fabrics–stash or print as needed. Thanks for asking. Loved reading your post! It’s good to know other fiber artists can’t pick just one medium either .. Sometimes I feel like I have ADD 🙂 I love it all! Thanks for a chance to win. 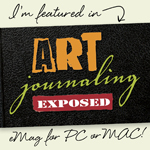 I love the insight that has come from reading each blog post on the blog hop. Thanks for the opportunity to own the book. Thanks for the review on Lynn’s new book. I am excited to see it. The interview was so interesting! Thanks! I would love to have this book. Thank you for writing this interview. It gives me a clearer idea about this book. This book kicks off my TBR art book file. Great interview, would love to try the techniques in the book. THanks for sharing Lynn’s book. I would love to own it. 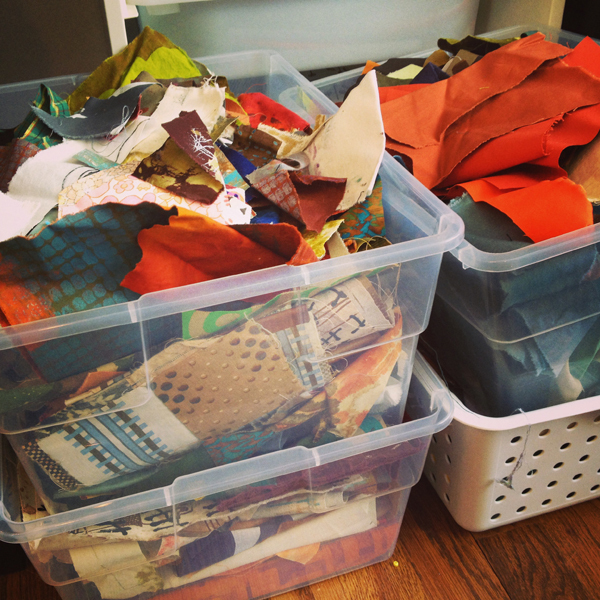 I am trying to de-stash my commercial fabrics to make room for more handmade ones. I would love to learn some new surface design techniques! Loved your review, and hope I win a copy of thi s book. Thank-you for giving us an opportunity like this. Amazing ?Melanie, I’d love to win this book. If I could vote, I’d vote a spot for you on Ellen!